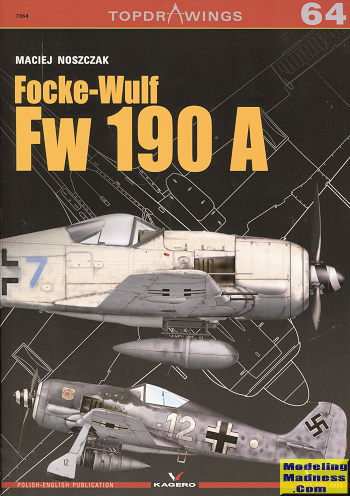 This particular book is their 64th set of plans in their Top Drawings series and concentrates on the FW-190A variants. Developed after the Bf-109, the FW-190 series was generally a superior aircraft in all respects. Able to carry a greater load, which made it an excellent fighter bomber, more heavily armed, which was a plus for attacking bombers, and much easier to handle on the ground. After initial issues with its BMW 801 engine, which was prone to overheating, it became a very reliable aircraft. Were it not for the ease of construction of the 109, the 190 may well have been built in greater numbers. It seems that 1/48 scale is the main scale for modelers and you will find that all of the major plans sections are in this scale. That includes the two very large fold outs that offer upper and lower plan views, ensuring that all aspects of the airframe are fully covered. The 1/72 modeler is not left out as the section that shows the differences between variants is reproduced in this scale. Let us also not forget the superlative and quite large full color profiles that are included, these also being to 1/48 scale. As a bit of a bonus, Kagero has included canopy masks for the 1/72 and 1/48 Tamiya kits.